What do we do when our friends have passed away, when we are too tired emotionally to make new ones, when we are too frail physically to take care of our property, our homes, ourselves… What will we do when we find ourselves just waiting on a worn down porch, for days, months and years? Marge is a lovely, amazingly resilient and tough lady in her mid-eighties who lives in Oxnard. Unfortunately, she has a condition which affects her balance, so it is extremely difficult to keep up on her housework, tend to the flowers and orchids she always loved to grow, let alone navigate the steps on her front porch. Because is so difficult to get around, she finally decided just to stay home – for years. All the neighbors she once considered her peers and friends have long ago passed away. A bit of depression seems only natural given the circumstances. The mobile home park manager suggested we might cheer her up by giving her mobile home some attention – some time visiting, some new paint, flowers in her garden, some decluttering and home repairs! At first she seems hesitant and skeptical! We work hard all day… painting the entire exterior and trim, repairing screens, panels and lattice on the porches. We de-cluttered all around the house, hoe’d, weeded, mulched and planted flowers in the front. Many, many thanks to Decor paints, a local business, who kindly donated some very high quality Benjamin Moore paint. We were so touched they went the second mile, discounting brushes and rollers for us, making sure we had enough that we wouldn’t run out mid-project, selecting matching color palettes for the trim and doors. Many, many thanks to the wonderful group of volunteers that came out and worked hard all day – in addition to our family, the Brizendines, we also had the Wittens and Lee families join us, as well as Michael, Kierstin, and Cassidy. Marge’s neighbors helped out as well, painted with us and loaned us ladders and their hose. The kids in our group were the most amazing workers! Special thanks to Carter Witten, our youngest volunteer and also the one with the most paint on his face at the end of the day! We feel as blessed by the love as Marge did! If some day we ever found ourselves getting older alone, waiting on a porch… I hope ACTION will still be active in our community! Thank you ACTION for stepping up to encourage Christians to connect those Holy Spirit-led “tugs at our hearts” into real opportunities to live compassionately. 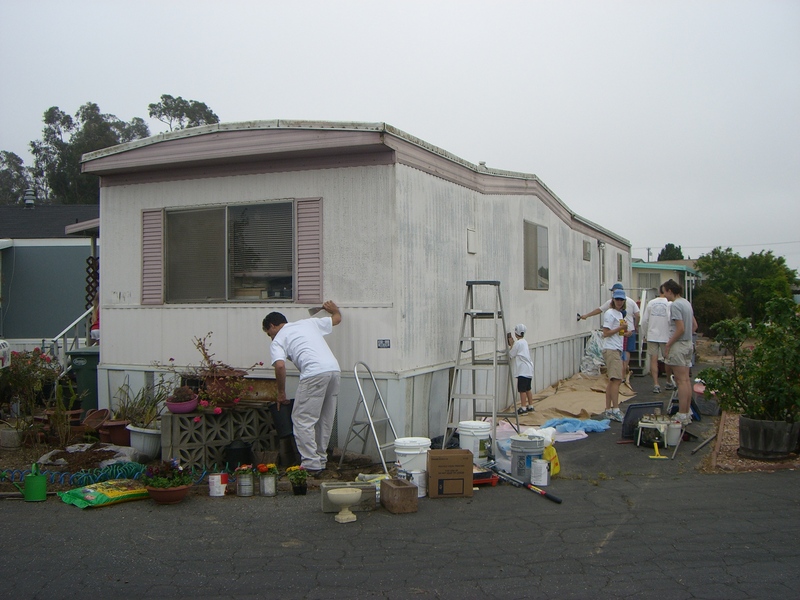 Share the post "Before and After pictures, mobile home in Sunny Acres, Oxnard"